The Angular JS will facilitate a faster and an easier data binding. It doesn’t require any developer to intervene at all. It is referred to as two -way data binding and ensures that changes made to the view are displayed instantly in the model and vice-versa. The Angular JS will reduce the burden on the server CPUs as it supports caching and many other processes. It also means that the server performs extremely well as it reduces the traffic. It reduces the traffic because it only serves static files and responds to the API calls. Rapid prototyping is due to the existence of the frameworks like Angular. By writing less code, you can also develop app prototypes with good functionality. you can also obtain feedback and make changes without getting annoyed. AngularJS will make use of directives which keep the scripts and HTML pages mess-free and also extremely organized. It also allows creating independent codes by cramming together specific functions and using them repeatedly. Other than the set of predefined directives, the framework also allows developers to create custom directives. The Angular JS builds highly testable application and websites. It allows you to do testing and end to end testing which makes testing and debugging much simpler. The various tools offered by the Angular JS framework are the Protractor, Jasmine and Karma. You can get familiar with AngularJS in a short period of time if you are a fast learner. The Angular JS provides a limited documentation which may affect the learning process. It doesn’t follow a straight learning graph so there you might face great difficulty in getting adapted to the framework. 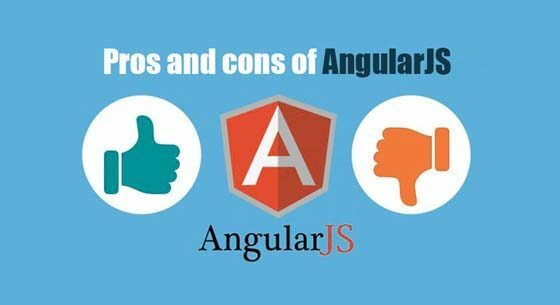 Angular can be extremely time-consuming if you are a developer who is completely unfamiliar with the Model-View-Controller architectural patterns and follow the traditional approach. The Angular JS is a library given by Google which aims at clearly separating the HTML rendering from your data. You can declare bindings in your HTML that describe how it should be rendered and to which data model your markup corresponds with it. If you need to modify any aspect of your page, you can do it by changing your HTML and CSS because the JS contains your data and the logic behind it.